HFC 33 saw three fighters claim pro titles, and I hope you were there because that might have been the last chance to see all three fight locally before they hit the big shows. Mike Santiago, Larry DiGiulio, and Chepe Mariscal all earned belts in what was a phenomenal event Saturday night at The Venue at Horseshoe Casino in Hammond. Mike Santiago had a quick night in the cage. 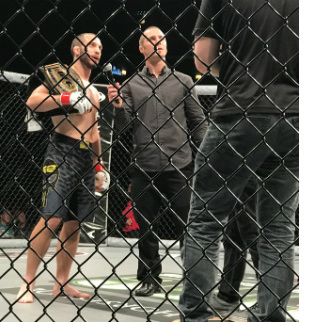 He came out looking incredibly relaxed against Nicholas Wayne as the two battled for the HFC lightweight title. He landed a takedown just thirty seconds into the fight and smoothly slid into mount. From there he dropped some loud, vicious elbows that connected as Wayne’s head was pinned to the canvas. It only took a few of those nasty elbows to propel referee Rob Hinds in between the fighters to wave it off. 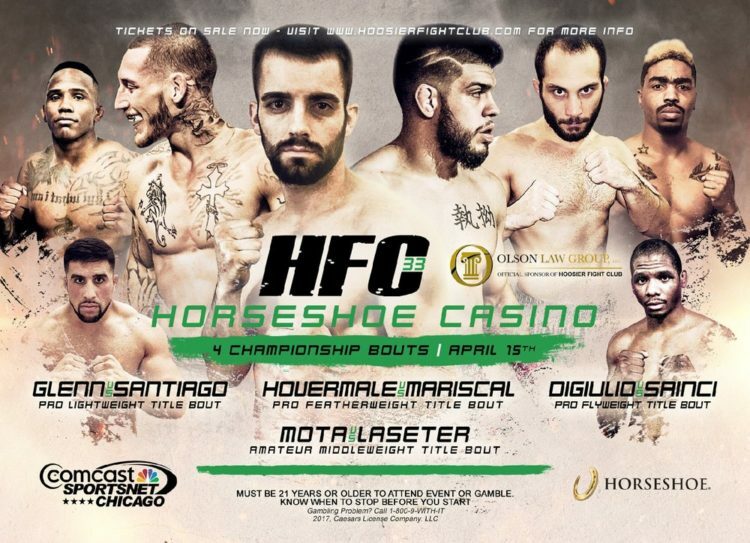 Santiago is now a two-division champion with HFC, having previously won their featherweight title. Gilbert Grappling’s Larry DiGiulio came out striking right away against opponent Mark Sainci in the HFC flyweight title fight, first going upstairs and then to the body. 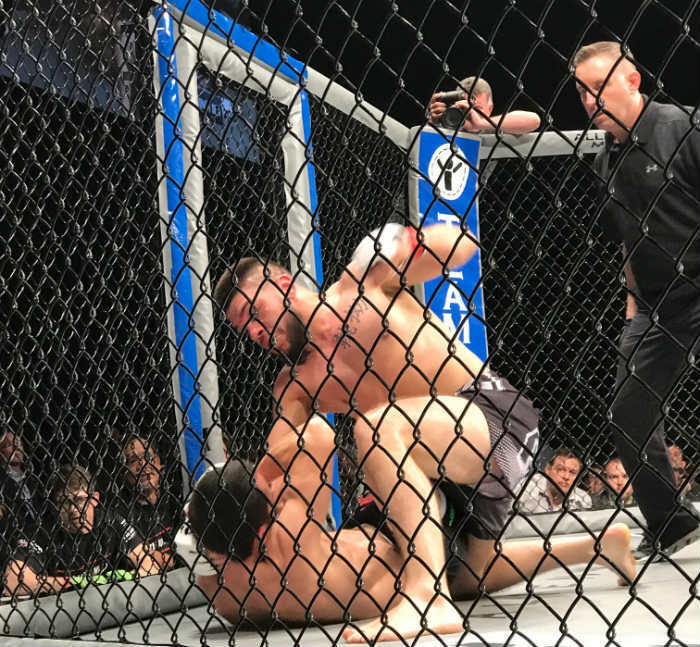 Sainci responded by pushing DiGiulio up against the cage, but he left his neck out and DiGiulio latched onto it and caught a guillotine choke. He quickly pulled guard and Sainci’s tap came soon after. 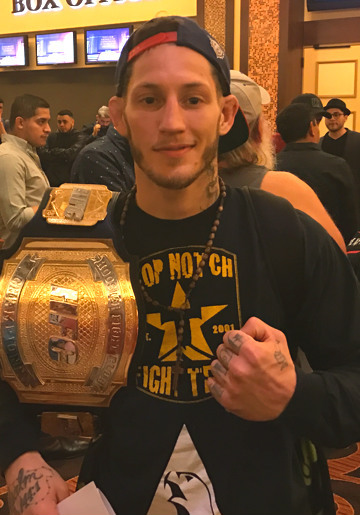 Gilbert Grappling took home two belts on Saturday, with Devin Laseter earning the HFC amateur middleweight title in a close split decision win. Laseter drew blood early with a powerful 1-2 combination. Then it was Mota’s turn as he caught him with a right hand that dropped him. Laseter displayed excellent movement, but it came at a price as he seemed to gas a bit near the end of round one. Mota scored a big takedown early round two, then landed another overhand right, but Laseter ate it. Mota took some shots from Laseter in round three then countered beautifully with a double leg and mounted Laseter, but he was able to escape. Laseter kept working the jab and Mota was leaking blood from his nose. It was what a title fight should be, and seemingly a very tough fight to judge.